Here’s the deal: nothing can travel faster than light. A black hole traps everything including light. So how does gravity escape a black hole? It’s a great question, and a perfectly reasonable one given most people’s understanding of gravity. The answer is that gravity doesn’t work the way you probably think it does. The most common way to think of gravity is as a force between two masses. For example, the Earth exerts a gravitational force on the Moon, and the Moon pulls back on the Earth in return. This “force model” of gravity is what Newton used to develop his law of universal gravity, which stood as the definite theory of gravity until the early 1900s, and is still used to this day. But built into this model of gravity are some assumptions that we can explore by playing the “what if?” game. Suppose we had a universe with a single mass. Imagine empty space extending as far as you like, with a single mass in the center (which we’ll call Bob). Would such a mass have gravity? If gravity is a force of one object on another object, then the answer would be no. There’s no other mass for Bob to pull on, so there’s no gravitational force. If we add another mass to our universe (call this one Alice), then Bob and Alice would each exert a force on each other, and gravity would exist. But gravity would only exist between Bob and Alice, and nowhere else in our empty universe. One of the problems with this force model is that it requires masses to exert forces on other masses across empty space. This “action at a distance” problem was resolved in part by Pierre-Simon Laplace in the early 1800s. His idea was that a mass must reach out to other masses with some kind of energy, which he called a field. Other masses would sense this field as a force acting upon them. So if we again imagine our Bob mass in a lonely universe, we would say that Bob has a gravitational field surrounding it, even if there were no other masses in the universe. This eliminates the need for action-at-a-distance, because when we put our Alice mass into the universe, it simply detects whatever gravitational field is at its location, and experiences a force. We know the gravitational field is due to Bob some distance away, but Alice simply knows there is a gravitational field at its location. Both the force model and field model of Newtonian gravity give the same predictions, so experimentally there’s no real way to distinguish one from the other. However fields are often an easier concept to work with mathematically, and fields are also used to describe things like electricity and magnetism, so we generally think of Newtonian gravity as a field. If the speed of gravity was finite, it would create gravitational waves. But this raises another question. Suppose in our Bob and Alice universe we suddenly shift Bob’s position. How long will it take for Alice to recognize the change? In other words, if we change the position of Bob, at what speed does the change propagate through the gravitational field? 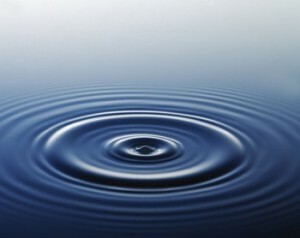 When Laplace looked at this idea he found that changes in a gravitational field had to happen instantly. The “speed of gravity” would have to be infinite. For example, if gravity travelled at the speed of light, the Earth would try to orbit the point where the Sun was 8.3 minutes ago (the time it takes light to travel from the Sun to Earth). As a result, Earth’s orbit would become unstable over time. At the time, the idea of gravity acting at infinite speed wasn’t seen as a problem. In fact it was used as an argument against alternative gravity ideas proposed at the time. But in the early 1900s Einstein developed his special theory of relativity, which (among other things) required that nothing could travel faster than light. If that’s the case, then there’s something wrong with our theory of gravity. By 1915 Einstein had developed a new model of gravity known as general relativity, which satisfied both Newton’s gravitational model and special relativity. 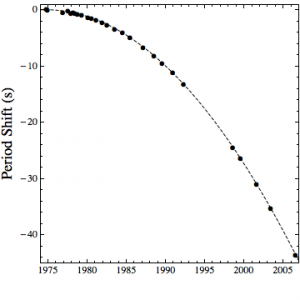 Decay of a pulsar orbit compared to general relativity (dotted line). According to theory, for example, when two large masses such as neutron stars orbit each other, they should produce gravitational waves that radiate away from them. These gravitational waves should travel at the speed of light. There have been experimental attempts to detect such gravitational waves, but they have been unsuccessful so far. We have, however, found indirect evidence of gravitational waves. 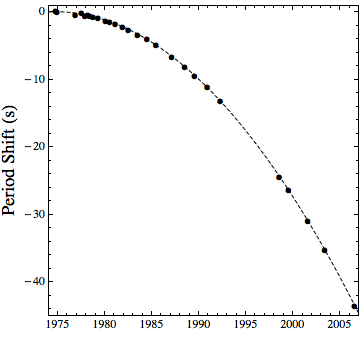 By observing a binary pulsar, we have observed its orbit decay slightly over time. This orbital decay is due to the fact that gravitational waves carry energy away from the system. The rate of this decay matches the prediction of general relativity perfectly. Since this rate of decay depends crucially on the speed of gravitational waves, this is also indirect confirmation that gravitational waves move at the speed of light. But if gravity moves at the speed of light, doesn’t that mean that planetary orbits should be unstable? Actually, no. When Laplace studied finite-speed gravity, he considered only the effect of the speed of gravity, which is what leads to his result, but in special and general relativity, the finite speed of light leads to other effects, such as time dilation due to relative motion, and the apparent change of mass due to relative motion. Mathematically these effects arise because of a property known as Poincaré invariance. Because of this invariance, the time delay of gravity and the velocity dependent effects of time and mass cancel out, so that effectively masses are attracted to where a mass is. This canceling effect means that for orbital motion it is as if gravity acts instantly. But wait a minute, how can a gravitational field have a finite speed and act instantly at the same time? 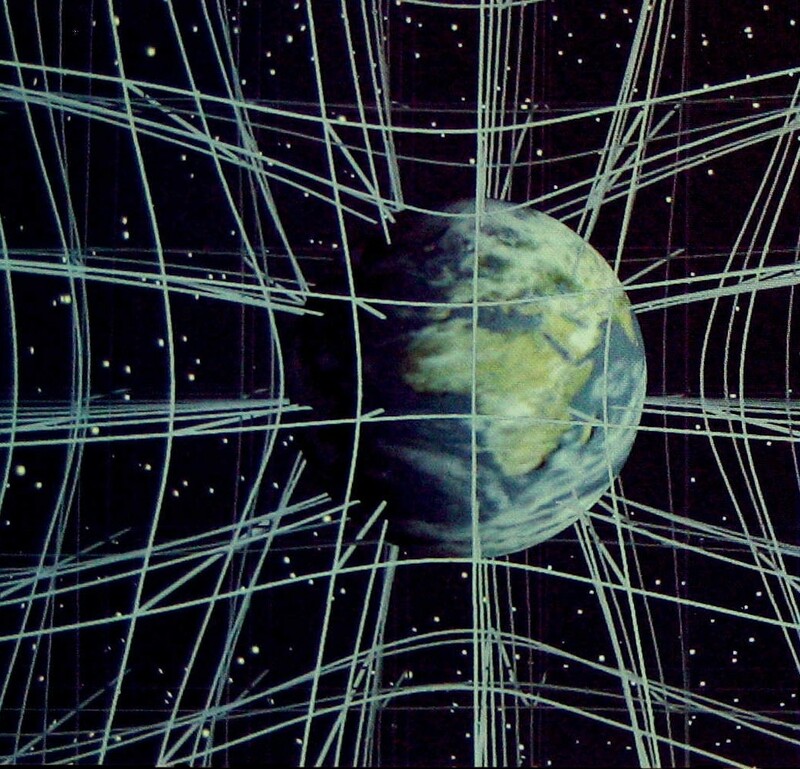 A gravitational field can’t, but in general relativity gravity is not an energy field. The relative nature of now. Since long before Newton, it was generally assumed that objects and energy fields interacted in space at particular times. In this way, space and time can be seen as a background against which things happen. Space and time were seen as a cosmic grid against which anything could be measured. In developing special relativity, Einstein found that space and time couldn’t be an absolute background. In Newton’s view, two events seen to occur at the same time will be seen to be simultaneous for all observers. But Einstein found that the constancy of light required this concept of “now” to be relative. Different observers moving at different speeds will disagree on the order of events. Rather than a fixed background, space and time is a relation between events that depends upon where and when the observer is. This principle carried forward into Einstein’s theory of gravity. In general relativity gravity is not an energy field. Instead, mass distorts the relations between space and time. If we go back to our earlier example, if we place mass Bob in an empty universe, the relations of space and time around it are distorted. When we place mass Alice nearby, the distortion of spacetime around it means that moves toward mass Bob. It looks as if Alice is being pulled toward Bob by a force, but it’s actually due to the fact that spacetime is distorted. This is how gravity can seem to act instantly while gravitational waves seem to travel at the speed of light. Gravity isn’t something that travels through space and time. Gravity is space and time. A black hole is an extreme distortion of space and time due to a very dense mass. Such a spacetime distortion can prevent light and matter from ever escaping. But the spacetime distortion is also gravity. It doesn’t need to escape the black hole, because it is the black hole. That’s the thing about science. Sometimes a simple question will pull you toward an unexpected answer. Or, space is displaced by matter and what we experience as gravity is actually the displacement pressure attempting to return space to it’s original non material condition. You have to be careful. Gravity isn’t a distortion of space; it is a distortion of spaceTIME. And you cannot consider spacetime as space and time grouped together for sake of convenience; spacetime is literally one single property. Space and time as separate standalone properties is a human invention; they are not real things which the universe recognizes. Well, Brian, about the gravity the things are clear. But what about the electric charges? Let we have a system of two black holes. The hole 1 has accepted more electrons from cosmic rays. The hole 2 has accepted more positrons also from cosmic rays. As a result the holes have electric charges. If they interact electrically, then this means that virtual photons overcome the horizonts. If they don’t interact then this means that the charges vanish. But in this case we have a violation of the charge conservation. I have same question. Thanks Rossen for asking it. A very tricky question. Basically if a charged system is denied interaction does it remain charged? Is it a problem of our definition of “charged” as a electrostatic potential to interact versus the intrinsic particle charge which is conserved and leads to the rise of that potential? Answering those may yield an answer. Gravity IS the shape if space in the presence of mass! If we understand this correctly, then the issue discussed above will make sense. What matter is !? Matter is just another form of space. Empty space is not empty cos it has another space in it, and another and another etc. Problem there is we don’t accept other dimensions during lack of experience to detect them or see them somehow. This reminds me on Don Juan Matus and Castaneda’s stories about Tonal and Nagual, where nagual is still part of tonal even if it is not part of this ‘real’ world. Huge disappointment for one wise shaman but very exciting for regular spiritual explorers. I see problem with Bob and Alice cos introducing Bob to Alice was predetermined work to achieve wrong point. Getting Bob to Alice was action cos fixed and expected reaction that we as humans are thinking. It’s a scam story. No one can believe that any Nagual can’t be Tonal in it’s matter. After a long long time I was recall one far and distant idea with isotopes and why they, and how they fit in this all story thing. So in my opinion isotopes are proof that space ‘must’ be in more than this one uniform form. I was thinking about …other dimension space etc. Space in space could be non tonal area. Why two neutron stars give us wrong clues ? They are there from long time and/or in given area which is unique and somehow predetermined so they give us ‘false positive’ gravity waves. Other story is our solar system. Also somehow uniquely coded to this and not more than this system. Same as we have elements with unique signatures, other elements are isotopes. Free form energy can get spin only if there is ‘space in space’ to give it a starting conditions to get that spin, more like friction mechanic. When you shortcut two batteries you got just sparks, sparks are illusion same as Bob and Alice or two neutron stars. Space of dark holes is uniquely coded to itself and exclusively to them. Therefore we perceive this as false positive intuition that is separated from our system. Trick is that there is more space forms we must take into account then if we wish to explain gravity. Gravity is self sustained structure during fractal foam of spatial sub dimension of itself to self and out of self. Like rebar in concrete what give it strength to structure, or concrete block would be unstable and would crumble itself. So the only explanation to gravity question is that space itself must be sub construction-ed of more sub dimensional space and so on and on. I have been waiting for such a clear explanation of gravity for a very long time. How about several good references for further study of this? Let me know how much physics and math background you have and I’ll suggest some texts. I studied Physics and Math till senior secondary. I think the initial question can only be understood in the framework of a quantum field theory of gravity. How do *gravitons* escape a black hole if they cannot move above the speed of light? Or why can’t they fall in in the first place. If there is nothing like *gravitational field*, its just a space-time distortion due to mass, can I conclude that there would be no *Gravitons* and *Gravitational waves*? We have indirect evidence of gravitational waves. 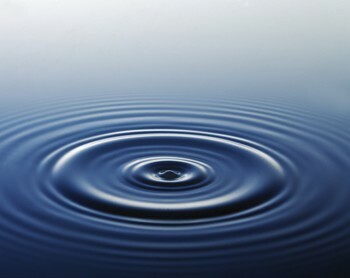 They are predicted in GR as ripples in spacetime. Gravitons are hypothetical, and may arise out of a quantum theory of gravity, but we don’t know what that might be. If there is no mass at all, what will be structure of spacetime? Will it curve on itself? Or be unprincipled? So is space and time (not SpaceTime) as we perceive from outside it at the singularity infinite? And if so how does mass ever reach the center. Or does the singularity occupy all space beyond the event horizon? Once inside wouldn’t that space as we perceive it verge on the infinite? If someone was in an object made of indestructible unobtainium from your vantage point would it look like you where falling into another universe(size wise)? This is of course breaking a lot of rules to say you can see what is behind the event horizon after you pass through it. Though I imagine you would still only be able to see behind you up until you found the singularity. Unless there was another form of matter that only existed there that could travel freely within the confines of the black hole. I’m sure this sounds rather elementary maybe even childish to those of you who have a basic understanding if them. I’m not a mathmatician so struggle to get my head around a lot of the technical stuff. However, to the extent I am able to understand it, I am interested. So, if space-time only exists when there is a Bob or Alice for space-time to relate to, does space-time exist if Cecil (a black hole) is the only item in the universe? I’m thinking thinking that yes is the answer but not too sure. There is no such thing as time…it is a man made concept. The 2 clocks experiment suggests that time can run at different speeds. The difference suggests that time does exist. If there was no difference, it would suggest time would not exist. I am not too happy about the explanation of how gravity is exerted by a Black Hole. We can, of course, make it a Just-So story as Newton did: instead of mystical forces or fields (which are really modes of calculation, not explanations of structure) we can have spacetime curvature without specifying any kind of underlying order or mechanism. So we can say that even if a part of the structure of spacetime in effect falls out of the set of all phenomena except gravity, it’s just that way — and close the science down. We’ve come to the end. It looks to me, though, like understanding gravity more deeply is going to require that Quantum theory. It’s funny, when ever a theory goes wrong, they just make up a new one to cover the holes in the first one! Jack-off’s ! Yeah! Maybe they should stick with an idea for thousands of years despite all evidence refuting it! Entrenched dogma for the win! If a Black Hole induces an extreme distortion of the space-time then, logically, the huge mass of the Black Hole is extremly distant to the Event Horizon of the Black Hole. How comes that the gravitational effects of that mass are so strong at such huge distances? And, if you don’t mind, one more question. 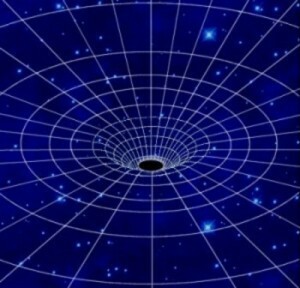 The Event Horizon of a Black Hole is a sphere where the gravity reaches a certaIn value, the same value for all Black Holes. This means that, regardless of their mass, at the same distance from the Event Horizon of any Black Hole the gravitational effects are the same. 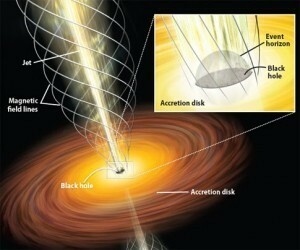 Doesn’t this make the microscopical Black Holes almost equally dangerous as the very massive ones? Only if you get close enough to one. Keep in mind that if you are 1,000 miles from a mountain, or 1,000 miles from a mountain-mass black hole, the gravitational pull from each is the same, and not that large. A blackhole’s event horizon radius depends on M, the mass. This is quite strange because the volume of a blackhole (the distance to the horizon) depends on radius cubed. If you double the mass of a blackhole the the volume of the blackhole is 8 times larger. This makes a small blackhole MUCH different than a large blackhole. For example if our solar system was filled with air about as dense as our lower atmosphere out to Jupiter this would be a blackhole. This blackhole would be HUGE and would have VERY low density (mass per unit volume under the horizon). It would also have a horizon that would be almost flat to something even as large as the Earth. If the Earth approached and could see the horizon it would look like a wall. This means almost no tidal forces would be at the horizon. Now a blackhole the size of the Earth’s mass would have an event horizon of something around a few centimeters. This blackhole has extreme density and extreme tidal forces many times the distance of the horizon. You’d be torn to shreds long before you’d reach a small blackhole’s horizon. Also Hawking Radiation greatly increases the smaller a blackhole is so you’d be fried. Finally, a blackhole depends only on the mass (and electric charge if it has net charge and the momentum of the mass). Being on the moon if the Earth would collapse to the size of a Earth-massed blackhole would do nothing to the moon in terms of gravity. Very good answer. The author seems to understand what may irritate a layman like me to ask this question. I have learnt a lot by it. So, thankyou for taking the time to answer this. The author says that the binary pulsar observation confirms that gravitational waves carry energy away from the system. This appears to be quite a significant loss of energy and suggests the same thing is happening to a black hole. Now, this energy is created from certain type of matter (or energy). Can it be that black hole (or parts of it) use up (substantially) all of this matter/energy after a period of time. Then there is not enough gravity to keep to the black hole together? It would explode, as particles do not was to be kept so closely together, like in a big bang? The binary pulsar evolves via gravitational wave/energy emission – proved Einstein’s postulate of quadrupole emission. Loss of orbital energy allows the two masses to approach and the orbit to speed up. LIGO’s pair of merging ‘black holes’ emit the energy equivalence of a couple of solar masses before they merge, giving the giant pulse in gravitational waves. No dispersion is found, in accord with GR, in their travel across a substantial fraction of the universe. LIGO’s analysis infers the distance from the energy emitted and drop-off in wave amplitude with distance. The wave pulse is a localised energy pulse travelling through space. Picturing gravity as a space-time distortion doesn’t work for gravitational waves – it’s properly analysed as a field with localised mass-energy via the Hilbert-Einstein equations . It’s high time text-book explanations caught up with modern practice. I’ll ask a question and then answer it. If we consider gravity to be propagated via gravitons, the how can gravitons escape the black hole, just like photons can’t escape? As someone in the previous comments asked: if two black holes are charged, then how can they interact with each other electro-magnetically if photons can’t escape them? Answer: All forces (maybe gravity also) operated via VIRTUAL particles. Such particles can even travel faster than light, and virtual photons and gravitons can even have mass. So, they can escape the black holes’ gravitational field(whatever that maybe). You did not really answer the question how gravity escapes blackhole. Yes, I did. Gravity isn’t an energy field, so the question of “escaping” a black hole isn’t relevant. As far as we know, nothing moves faster than a photon. General Relativity is not QM compliant and, so, is almost certainly wrong. Semiclassical physics can give us an idea of how things work, even without a complete theory of quantum gravity. Ok. energy of several sun masses was released in two black hole merger in matter of miliseconds. Well, where is this energy now? It is appear as space distortion, but what happened? Can space and time without material objects conserve/hold energy? How? Or somehow everything (material objects) is slightly warmer and photons slightly changed color? I’m wondering about the definition of speed of light. Given that it’s the gravity and spacetime itself that is the playground for everything, is it safe to say that the speed limit, we know as speed of light, is actually a property of spacetime and light is just another victim of it as any other particle? Therefore, wouldn’t it be better to call it a speed of gravity? Otherwise, it seems very counterintuitive that the gravitational waves (which have been detected) are subject to a speed limit given by a speed of light. You could call it something like the speed of action. It is a relativistic limit that light and gravitational speed both follow. Are there any theories or hypothesis that would explain the origin of this limit? Where is it coming from? There’s a good PBS Space Time video “The Speed of Light is NOT About Light” on YouTube that covers this topic well. Briefly, the speed limit is the speed of causality — the maximum speed at which any two parts of the Universe can communicate. It’s a basic property of this Universe. The velocity at which information travels (presumably the velocity with which the resolution of quantum events is propagated). Spitballing here… If black holes are gravity windows into other universes, could dark matter simply be the influence of gravity from other universes being felt through the black holes into our universe? When close to the black hole gravity is dominated by it, but further away the influence of the mass of potentially many universes on the “other side” of the black hole make themselves felt. Since the gravity could only be felt in the direction of the black hole itself would this translate to a “extra mass” observed at a distance? Obviously, we don’t yet understand the gravity of the situation. But the math seems to be working… at least today; as spooky action at a distance cancelled out! How does mass distort space time? What is an atom doing to communicate with its surroundings? If spacetime distortions generate potential energy between two objects where does the energy come from?